Juliana likes to take her shoes off – in the car, in her high chair, in the shopping cart, and when she is sitting on the floor to play with toys – and the socks usually come off as well. But she can put them on herself and she puts each one on the correct foot. 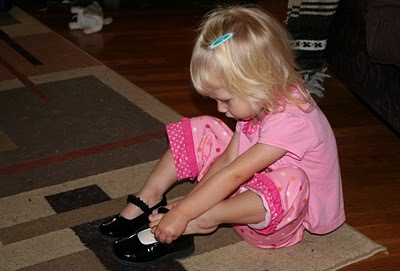 One morning this week, she kept telling me that she wanted to wear her “tiny shoes”. Then she pointed at the shoes that she wanted and apparently she had been saying “shiny shoes”. She can count to 10 herself, although she usually skips #4. She can say the alphabet, strong though the letter P, and then she sometimes she becomes distracted and quits at that point.